Tickets is a symphony of film presented in three movements and written by three different composers. This gives it three brilliant facets but unfortunately no diamond at its center. 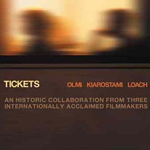 The three directors, Ermanno Olmi, Abbas Kiarostami, and Ken Loach, collaborated from start to finish on a film project set aboard a train traveling from Austria to Rome. Each director filmed a portrait of one or more of the passengers, some of whom may appear in the other director’s film. Essentially each film segment is its own movie. Curiously there is a fourth movement to this work in the form of a featurette on the making of Tickets. This fourth part, a bonus feature of the DVD, in my opinion completes the work. The inclusion of the documentary makes the DVD better than a free-standing version of the film, in that it shows the problems inherent in such an undertaking and the masterful way many of them are resolved. Without this backstory, the film itself is not that remarkable, lacking the unity of vision that one director would (presumably) bring. When this viewer experienced in some small way the collaborative energy that the directors and their staffs put into the project, Tickets seemed more unified and shone with a brighter light. The three parts are named as separate films in the accompanying notes but transition smoothly between one another without title or break between the parts. Seen separately, they are masterful examples of filmmaking, if somewhat enigmatic in purpose. Seen together, they are not quite cohesive enough to carry the shared theme that is explained in the making-of bonus feature: the travails of a desperate Albanian family trying to get to Rome. I’ll consider each director’s contribution separately. Olmi sets a tone of foreboding with a suggestion that there may be a terrorist event about to occur. A professor (Carlo Delle Piane), a man from the privileged strata of society, is forced by a “security alert” to travel home by train. He would rather not but accepts his fate. A character named as “The PR Lady” (Valeria Bruni Tedeschi) cleverly arranges for him to have assured seating in the dinning car by buying two tickets. The added expense is not an issue. He congratulates her on her travel savvy. For the rest of the trip he is alternately startled by loud noises (a bomb!? ), suspicious of and annoyed by the other people on the train (particularly a “dark” family standing without a place to sit in between cars) and a mysterious military officer who sits uninvited at his table. The Professor’s distraction is heightened by his memory of The PR Lady who saw him off at the Austrian station and there kissed him goodbye. He is falling in love with her and at the same time knows that it’s an old man’s foolish daydream. Olmi’s depiction of the Professor’s introspection is masterful. The Professor forgets about the “important” report he is composing on his laptop and transcends his self pity by coming to the aid of the Albanian family. They have spilled a thermos of milk intended for the baby who will now go hungry. The Professor orders a glass of warm milk from the waiter and then hand delivers it to the family.... end of segment. Kiarostami begins his direction at a stop along the line of the train. An Italian Lady (Silvana De Santis) and her traveling companion Filippo (Filippo Trojano), a young man who may be her adult son, are introduced into the film. At the stop, the train has become over crowded. The Italian Lady and Flippo have second-class Tickets but the car is full. The Lady puts her head down and charges on into the first-class car. She finds a pair of seats that suit her but Filippo says that they are reserved. She tells him to sit and that ends the argument. If The Professor was a quiet mild-mannered and polite man, she’s his exact opposite, exploiting her age and gender with a pushy aggressiveness. Filippo looks on appalled and embarrassed. What power does she hold over him that forces Filippo to jump to her every command? It is not explained. Kiarostami then launches into an exposition on the theme of “things aren’t always as they appear” when a man returning to his seat finds The Italian Lady apparently using his mobile phone. This is followed by a scene of “things are exactly as they appear” when the actual owners of the reserved seats arrive. Filippo temporarily escapes by talking to another passenger, a young girl who it turns out knows him from an earlier time. He doesn’t really remember her, but is relived to have someone to talk to. The Italian Lady continues to heap on the abuse until Filippo can not stand it any longer and leaves her. When the train comes to her stop she is left sitting on her luggage alone at the station (the man with whom she had the phone argument having unhappily helped her off the train). Filippo is no where to be seen... end of segment. Ken Loach begins his contribution with a boisterous introduction of three young men. They are Scottish soccer fans on their way to Rome for The Big Game. If The Professor was a well heeled professional, and the Italian Lady was a middle class matron keeping up appearances, the lads are working class boys who’ve had to save every penny to make it to Rome. They have all the appearances of being the dreaded British Football Hooligans. They’re loud and crude, using the “F” word with a frequency not seen since Al Pachino in Scarface. But taking his clue from Kiarostami’s “things aren’t as they seem” sketch, Loach has the boys kindly striking up a conversation with the Albanian Boy (Klajdi Qorraj). The Albanian Family has resurfaced and they are now sitting onboard the car. The Scots share their food with The Boy... maybe the “hooligans” aren’t so bad after all. Things get complicated when one of them, Jamesy (Martin Compston), discovers his train ticket has gone missing. Spaceman (William Ruane) fingers the Albanian Boy and a confrontation ensues. Is this another case of misdirection?... no. The Boy has lifted the ticket. The Albainian Girl (Blerta Cahani) tearfully returns the ticket and explains that the family has been swindled out of all their money and they don’t have enough Tickets for everyone... they are one short. Do the lads give up one of their Tickets to help them out? If they do they’ll be arrested at Rome for traveling with out paying for their fare. They realize that although they could be temporarily inconvenienced (they’ll miss the game and probably loose their jobs at the supermarket back in Scotland), it’s a life and death situation for the Albanians. Like The Professor, they do the right thing. What happens to the boys when they get to Rome?... well I can’t give it all away but there’s a satisfying if somewhat improbable conclusion (hint: The Celtics will have all their fans at the game). And there you have three nicely crafted elements that lack only some kind of cement to form a truly greater work. I would offer that had each director done one rough cut and then, after seeing the other two efforts, gone back and either reedited or even shot extra footage that would play off of what the other directors had done, there would have been the cohesion that is now missing. Still the world is a better place for having Tickets than not, though like most things, there’s room for improvement. Tickets X 3: A Production Documentary and the Facets Cine-Notes booklet are the only two extra features. As described above, the documentary is key to rounding this project out, and the booklet is a useful read on the individual directors. The question remains, what does that say about the main feature if the extras are so important. The visuals are solid, but the sound is variable; then again, it’s noisy on a train. Luckily, they include English subtitles when the Scots speak (and indeed when the soldiers speak English in the first section), so maybe it’s too noisy? Watch it straight through, but make a point of then watching the doc. It all makes a lot more sense if you do (at least it did for me).